Top SEO Women took off, and turned into something more than a list of great women. Top SEO Women of 2011 received even better reception, and listed women like Lyena Solomon, Melissa Fach, and Debra Mastaler. We went a step further, developing a logo for our new project. –Yet, in the comments, people were mentioning how their choices would have been this person, or those people. Some, we’d never even heard of. An idea began to form – why not use Top SEO Women to bring other SEO women to light? Debra Mastaler, for example, is very well known, as are the other women listed above. What about the others? Although SEO is (or seems to be) a male dominated industry, that doesn’t necessarily mean the only female optimizers are the ones we know about, does it? 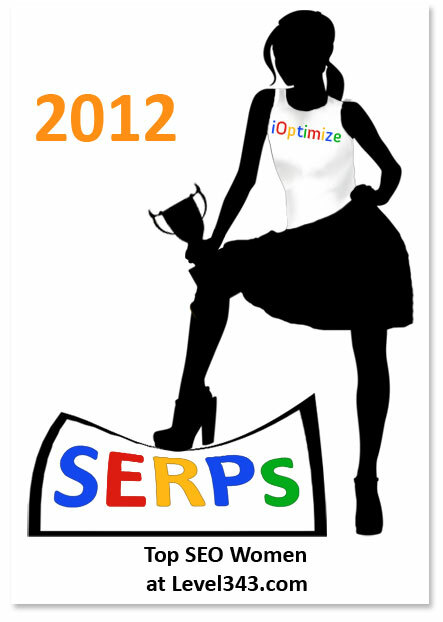 For 2012, we opened up Top SEO Women to nominations. Readers obliged, to the point that we had to stop at thirty nominations. Over 1400 responded during the polling period – from where this all started, as a short list of women we knew, that’s a fantastic jump. We’re extremely pleased that it’s done so well, and appreciate the responses, nominations, comments and votes from everyone involved. SEO has evolved since its inception, and that truth is pointed out by the list of women in SEO who were nominated for this year’s awards. Included in the list were link builders, copywriters, bloggers and more – all who contribute to the industry in some way. All of the nominees are excellent at what they do, and we’re honored to have been able to include them in the nomination list. Eren Mckay started college for physical therapy but decided that it got in the way of taking care of her 3 children. So she put that on hold for a while. When her kids started growing up, her attention turned towards creating an online business. She didn’t want to be trapped in a 9 to 5 job and realized that the way to earn the freedom that she desired for herself and her family was to learn SEO. She spent countless hours studying, researching, testing and implementing SEO tactics in order to find out what truly worked and would continue to get results in the future. Knowing how to rank pages and multiply those efforts through outsourcing and systems would enable her to create a passive income business model. This would eventually give her more time and freedom to focus on what really matters: her friends and family. You can find out more about what Eren is busy doing on her Goolge+ page as a Social Media Strategist, Translator, English (ESL) Teacher! For the past 9 years, Mariachiara Marsella has immersed herself in all things web marketing, having been a copywriter, analyst and now a full time SEO. She began as a local newspaper editor in 1999, but after winning a short story writing competition in 2002, turned toward writing full time. By 2003, she found herself writing web content, and becoming more intrigued by optimization and search. Since then, Mariachiara hasn’t looked back. She dived into web marketing, gaining as much information as she could. Intelligent and a quick learner, she went from writing web content to becoming a web analyzer, to a web marketing manager in four years. In 2007, Mariachiara started working for Fullsix, in Milan, as an SEO specialist. Two years later, she was teaching SEO and web marketing at Delta Comunicazione in Rome. Since 2010, she’s been the online marketing manager for PMI Servizi, creating SEO/SEM strategies, coordinating teams of web programmers, developers and designers, and, in general, doing what all good SEOs do – taking her clients to the top. For someone who “fell” into copywriting, Heather Lloyd-Martin has come a long way. She started as an advertising sales manager, occasionally writing copy for clients. Although sales was in her blood (her family also had a sales background), writing copy was an aside. By 1997, Heather’s copywriting skills had greatly improved, and she started writing for websites as a freelancer. That was the end of the story – or it would have been, if she hadn’t been on the Women Talk Business discussion list. Jill Whalen contacted her to discuss integrating keywords into website copy, and SEO copywriting was born. A first gen search marketer, Heather is a 20+ year marketing veteran. She’s the CEO of SuccessWorks, and trains corporate in-house SEO copywriters. She’s a board member of American Writers and Artists Inc. Online and on the advisory board for Search Engine Marketing Association of Portland (SEMpdx), as well as a frequent speaker for SMX (Search Marketing Expo) and other notable search conferences. She also developed the first SEO copywriting certification program, and has become one of the most well known SEO copywriters in the industry. Our thanks to the SEO Training Dojo for their prize contribution, and congratulations to the winners of Level343’s Top Women in SEO for 2012! For the Top SEO Women of this year who would like to sport the logo, you can click on the image, then right click and save as. We provided the highest resolution; feel free to set the size you need for your site. If you need a .png version, please contact us. For those who would like to support the Top SEO Women with some link love, please link to this post. Thank you for your support! Last year, we added a logo. This year, we added a couple of prizes. Top Women in SEO is still growing from infancy, however, and we’re already looking forward to next year. We’re currently working on refining the nominating and voting process, and all that “rules and regulations” stuff to ensure a good run. If your company is interested in sponsoring the Top Women in SEO 2013, please contact Level343.